Travel tips and suggestions for Prague tourist. Recommendations about the best accommodation options, restaurants and shopping places in the city. “Prague never lets you go. This dear little mother has sharp claws” says Kafka when describing his passion about this fabulous city. When you inhale the magical air of Prague, we bet you will never forget this feeling. The legendary beauty of Czech Republic, Prague’s magic is addictive. According to a general belief, Adolf Hitler was also so tempted by the beauty of Prague that he could not sacrifice this beauty and spared it. This makes sense since Prague is the city that may simply arouse different feelings in you. This legendary, epic beauty of Prague has been mesmerizing people from all over the world for centuries. Walking by Vltava River with classic music notes in his ear was fascinating for Milan Kundera and it will definitely be fascinating also for you. 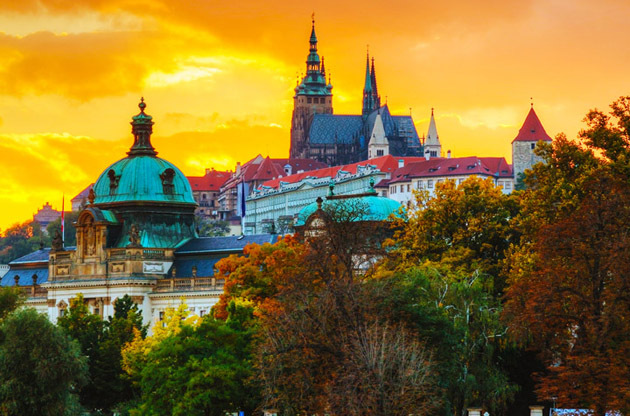 Gothic architecture, mysterious and somber atmosphere, famous bridges on Vltava River, classic music, beer, Becherovka, puppets, crystals, Bohemian art and of course a deep history evoke in your mind when you hear the name of Prague. The set of many books, the dream of many people, the passion for the lovers, the heritage of the history… Prague or Praha is a city which would dazzle you with a sense of timelessness. Indulge yourself in the charm of Middle Ages with a taste of Gothic architecture in this mystifying city. Vaclav Havel Airport, formerly known as Prague Ruzyne International Airport is 20 km away from the city center. For the transfer options from airport to the city centre, you can visit Vaclav Havel Airport’s official website. Czech beer is the best in Europe. Taste any of them and enjoy. Watch a show at Blacktheatre or Laterna Magica. Watch the astronomical clock’s animation. Go to a classical music concert. Old Town is the epitome of Prague. You may like to watch the animation of the astronomical clock of Prague, sit at the cozy cafés, buy from the souvenir shops and see the Jewish Square (Josefov) to smell a bit of history. Being a traditional place for celebrations, demonstrations or any kind of public gatherings, Wenceslas Square is the main city square in the New Town. Standing at 63.5 meters high, Petrin Tower is famous for resembling Eiffel Tower. Built as a observation tower, Petrin Tower is now a major tourist attraction. Founded in 1818, National Museum has been home to nearly 14 million items in 10 different buildings. From national history to art, librarianship and music, National Museum has so much to offer. Opened in 2011, Museum of Communism is the first museum devoted to a system of the former Soviet Union. To get an idea about how Czech people lived under the communist regime, this museum will help a lot. Located in the Prague Castle, it is the only privately owned palace. Do not miss the chance to explore in Europe’s history through the magnificent pieces in the gallery. In Prague, classic music concerts, jazz clubs, puppet shows and black light theatre is highly popular. Here is a compact list of where you can prefer for these activities. Founded in 1950s, this jazz club is known for being the oldest in town and Bill Clinton’s playing the saxophone here when he once visited Prague. Being a fascinating baroque complex in the Old Town, Klementinum is also the host for classical music concerts. National Marionette Theatre is one of the most popular places for puppet shows in Prague. Enjoy watching an original puppet show in this little and lovely theatre. Above all, shows of Black Light Theatre and Laterna Magika is highly recommended. If you like to dine accompanied by the best vines, magnificent view of Charles Bridge and Prague Tower, the premiere restaurant of Prague is waiting for you. Kampa Park Restaurant is where you can prefer for the best seafood and a beautiful scenery by the river on Kampa Island. Live piano, crystal chandeliersn hanging from the ceiling and fresh flowers… Francouzska Restaurant offers the gleaming environment that you are worth for. Be sure you have enough spaces in your luggage for the things that are listed below since you may be regretful if you leave Prague without buying them. You can swim in a pool filled with the natural spring water in this spa center and get inspired by the fabulous buildings that will make you feel like you are in a fairytale. If you like to find some peace in the water of somber Vltava River, this river cruise will give you the chance to see Prague from a different angle. Being under the coverage of UNESCO World Heritage List, Kutna Hora is the home to only church whose interior design was made using only human bones. Prague is both a dynamic and a historic city that makes it a source of inspiration. This inspiration will add up to the international gatherings’ content and creates more remarkable organizations. The easy city transportation, easily accessible venues and the hotels equipped with specially trained staff and the latest technologies are only some of the reasons why Prague is a matchless hub for international events. Hosted vital events like NATO and IMF meetings, Prague can deal with any kinds of events of high or low capacities.